I’ve been a fan of the Onechanbara series for quite a while. Its over-the-top gameplay and just the ridiculous nature of those games make them fun to play, despite their flaws. When I heard Aksys games was bringing over Tamsoft’s latest entry in the Onechanbara universe, School Girl / Zombie Hunter, I got pretty excited. I mean, who doesn’t want to slay zombies with an arsenal of weapons while wearing sailor suits? That being said, let’s see if this zombie slaying romp is worth your hard earned cash! The story takes place at Kirisaku High School, a highly prestigious school known for its balance between academics and sports. Five girls find themselves cut off from the outside world by the zombie horde. These girls will now have to work on their own and as a group if they have any hope of reaching the ZDF and escaping the school alive! While the story premise here is very basic, the girl’s interactions with each other keep it interesting, especially when you complete the bonus missions to see what kind of luxury items the girls receive. Some of these scenes are just outright hilarious and all of them are pretty entertaining. There may not be a lot of depth or any genre breaking moments here, but this tale is certainly enjoyable. The graphics here are very middle of the road. The character models are detailed, but their faces have an unnatural look about them. It’s almost like they tried to animate Barbie dolls or something. The lip syncing here is abysmal. The game is not dubbed, but even the Japanese audio doesn’t come close to matching. Though I did get a good laugh out of that, because it made me remember all the poorly dubbed Jackie Chan movies I’ve seen. 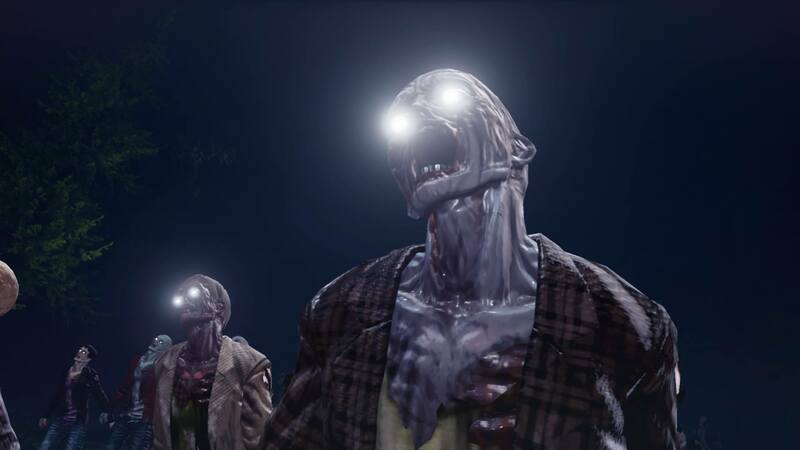 The zombie models look really nice and there is a good variety of enemy models for the zombie horde. The framerate stays pretty steady unless there are just ton of enemies on screen or a bunch try to all spawn in at once. Tamsoft really skimped out on the music in this one. The game has a great opening track and there are a few new pieces of music, but a lot of the soundtrack has been recycled from Onechanbara. You will notice Funky Peach among other pieces of music from that series has found its way here. This is not necessarily a bad thing, but if you’re thinking “hey, I’ve heard this tune before,” you likely have. The game is fully dubbed in Japanese and the voice actors do a great job giving these girls personality. There is no English dub for the game. The basic gameplay here is that of a third person shooter. The girls have an arsenal of weapons at their disposal to wade through the zombie hordes. These include pistols, shotguns, sniper rifles, SMGs, assault rifles, and even rocket launchers. You will find tons of different variations of these weapons, each with different attack power, fire rate, reload speed and even special abilities. These can include improved damage, accuracy, blast (which knocks back enemies), or dismemberment, which blows the legs off your foes making them crawl around. 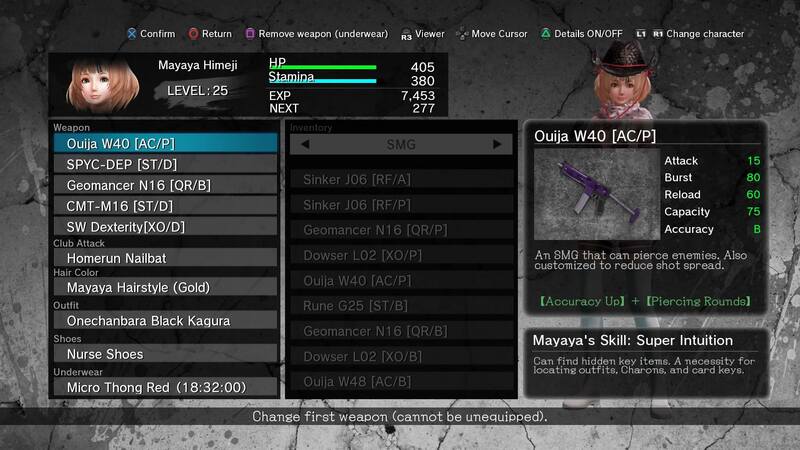 You take up to five weapons on a single mission, and choosing the right loadout can make missions much easier. Some of the mission types include defend the base, reach the destination, defeat the boss and more. In addition to your guns the girls each have a melee weapon. These are very important if you get surround by zombies and just need them to back off. They will use a bit of your stamina gauge but are life saving in a pinch. You can unlock more powerful melee weapons by completing some of the bonus missions with certain girls. Each character also has a special skill, which can range from Mayaya’s ability to find hidden items, Charons, and Keys, to Sayuri’s first aid, which allows her to revive a teammate without an item. Most missions will force you to use a certain gal the first time you take them on. After completing it you can redo the mission with any girl of your choosing. On stages with Charons, which are hidden zombie birds, replaying with Mayaya would be your best bet since she can find them really easily. Defeating these unique zombies will unlock new hair colors, underwear, and rocket launchers. Now to talk about what makes this game unique, dressing up the girls. Throughout the game you will find many different outfits to dress up in. These include normal school uniforms, gym clothes, swimsuits, and nurse’s outfits. These can be found in a variety of colors, and you can also unlock new hair colors and find some different sets of shoes to complete your look. If you tap the touch pad during a mission your character will discard her current outfit down to the underwear, which will distract the zombies for a short time. Later on in the game you will be able to make underwear traps by having the girls shower. This is done from the equipment menu and will only show a short scene of the girl showering. These traps will be more effective the longer the girl has had on said underwear before you shower. We love Japan! School Girl / Zombie Hunter is certainly not a game without flaws, but its one of those games that is a ton of fun in spite of them. You will get killed a few times in a cheap way, like a big zombie getting you stuck in a corner, and the production values are certainly not AAA, but the fun factor of mowing down hordes of zombies with sexily-dressed girls will keep you coming back for more. You can even play this online with up to three friends. At its budget price tag of $39.99 you get around 50 missions with two difficulties of zombie slaying goodness, some really great outfits for the girls and tons of weapons to choose from. You can even download some really skimpy DLC outfits for a buck each. I spent right around 12 hours completing all the missions once, but will likely replay a lot of them with different girls and weapons. 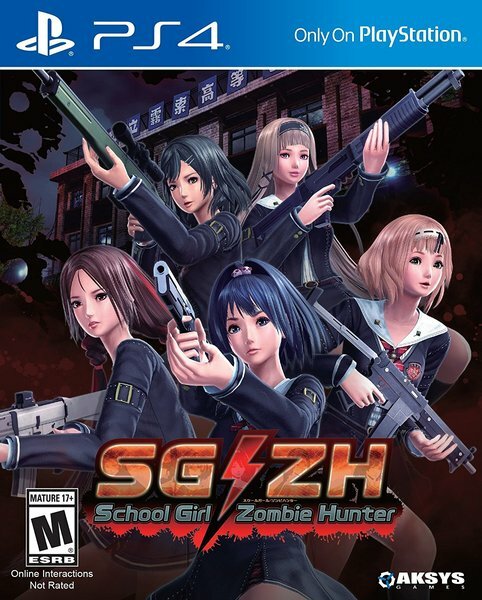 If you are a fan of the Onechanbara series or if you just wanna have some mindless fun slaughtering hordes of zombies with cute schoolgirls, snag this title ASAP. You won’t regret it.